Mich. judge to convicted killer: "I hope you die in prison"
Judge John McBain sentenced 31-year-old Camia Gamet to life in prison without the possibility of parole on Wednesday for killing her boyfriend in 2012. When Gamet appeared to mock the victim's grieving family members by rolling her eyes, the judge lost his temper, according to the station. WNEM reports McBain threatened to tape Gamet's mouth shut, saying, "You're going to shut your mouth or I'm going to have some duct tape put on it." "I agree with [the victim's] family. I hope you die in prison," McBain said. Gamet was convicted in March of fatally stabbing her boyfriend, Marcel Hill. 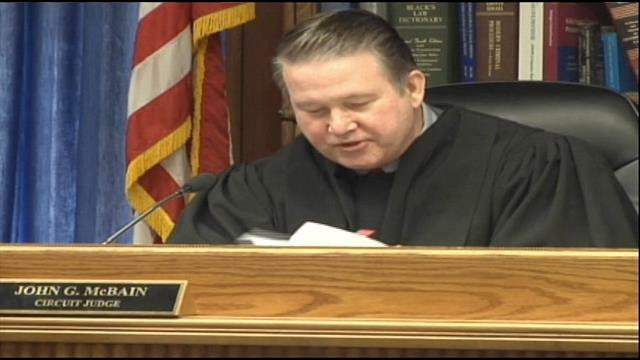 The judge called it one of the worst cases he has ever seen, according to the station. He told Gamet that she "gutted [Hill] like a fish." "If this was a death penalty state, you'd be getting the chair," he told Gamet.